Woocommerce is one of the most popular Wordpress plugins and without a doubt it is most definitely the most popular shopping cart plugin. One of the reasons why it has become so popular is the fact that it is full of features and that it easily integrates to any self-hosted Wordpress install. Although Woocommerce will work with pretty much any Wordpress theme, to get it looking it’s best you might want to have a look at the many premium themes and templates that are available to buy online. Once you start searching for the best Woocommerce theme for your online store, you’ll probably be overwhelmed at the sheer number of themes available - there are literally thousands all with different options and features, so what we’ve tried to do here is take the pain away and provide you with a list of the Top Five Woocommerce Themes for 2014! 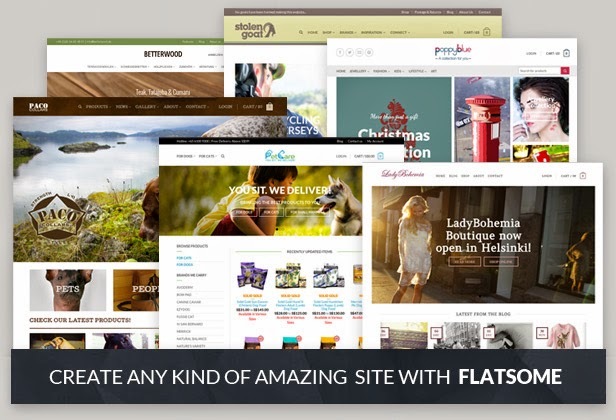 Flatsome is optimised for mobile and Retina screens and is a truly beautiful responsive theme that has a modern look and feel to it. Featuring CSS animated banners as well as touch sliders, flexible layouts and its easy to customise and the style as well as the colors. The Retailer is another fully responsive premium Woocommerce theme which as you’ve already probably guessed has a “Retail” theme to it. It is fully customisable and comes Retina and mobile ready and is also Multi-language ready if you want to sell in other countries. The Retailer is a great looking theme that is ideally suited to fashion stores, but as with all of these themes for Woocommerce, it would suit other Woocommerce store types. Bazar Shop from Yi Themes is a great looking multi-purpose template which can be used to build corporate style websites as well as ecommerce stores. It comes with a mass of features including unlimited layout options, a mega menu, is fully SEO optimised and has more than 300 built in short codes as well as selection of custom widgets. This has to be one the best Woocommerce themes I’ve seen and I can’t really do it it justice here in this quick summary. Pop across the Themeforest and have a read of all the amazing reviews and comments Bazar Shop gets from it’s existing users. 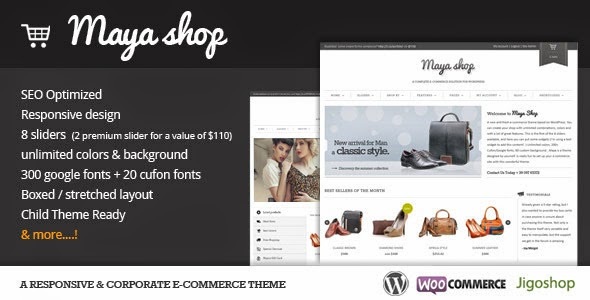 MayaShop, again from Yithemes is a flexible and responsive premium theme for both Jigoshop and Woocommerce. 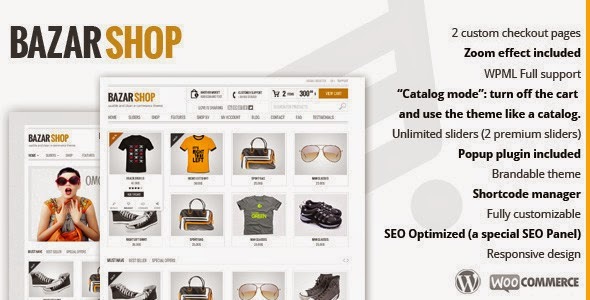 It allows you to create a powerful as well as versatile Wordpress based web store. With MayaShop you can take contral of the look and feel of your store with it’s unlimited layouts options and skins. It’s an SEO optimised template, and is also responsive and mobile ready, so your customers will be able to shop at your store on any device. With more options and features than you can shake a stick at, MayaShop will suite any sort of Woocomerce or Jigoshop online store. KALLYAS claims to be the "most complete theme ever created” which is a big claim to make, but then looking at it’s feature list and seeing what it’s capable of, you soon see why the developers feel they are justified in making such a bold claim. It has modern clean style that can be adapted in a multitude of ways to suite almost all types of websites. It features a powerful admin framework and built in page builder which allow easy editing and customisations. Because the template is so versatile, you can set up the homepage in any number of different variations and it also has a large number of built-in custom page types . I agree, this looks like a sound decision, and in that light I think I'd have described it as more of a 'hedge' than a 'bet.' If the Bow land does not produce much, whether for reasons below or above the surface, the UK will be quite grateful for the baseline power. 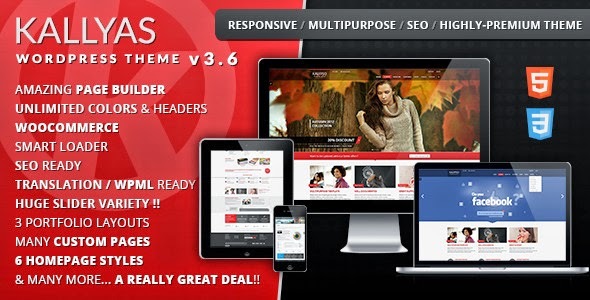 Responsive Website Australia. The main object of the Affity Solutions is to provide quality web services and is among the few software development company in Australia. Businesses that use E-Commerce are expanding their options for more customers. ... New businesses should keep things as simple as possible when starting E-Commerce. ... You must secure your E-Commerce or E-Business from the ground up if possible. ... There are some musts that companies and small business owners should have to make the E-Commerce. We are the “online store builder” that helps you with an ecommerce online store . Hi! nice post.. Get the more important and high ranking theme for E commerce site. With Woocommerce capabilities. Beautiful blog and it's really interesting and i love it well done. PHP is a general-purpose language that is available for free use. It has remained the priority of most of the developers for the reason that they can access its core functionality without having any special permissions or payments. Thousands of apps are getting published, each and everyday, and what matters is to obtain the highest discover ability and to achieve the highest ratings possible. very Nice and fantastic Blog Thanks for sharing with us..
Sribharat serves as Board Member of TiE Amaravathi and a Board member and Learning Chair of EO Andhra Pradesh.